Olivia Wilde has been doing some work behind the camera but is back in front with her new film 'A Vigilante'. She attended the premiere last night(March 27th) at the Vista Theater in LA. 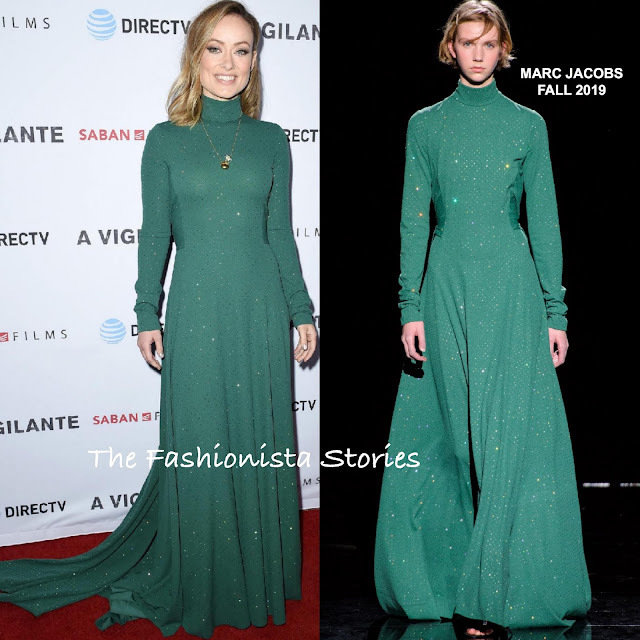 Olivia's MARC JACOBS FALL 2019 long sleeve green turtleneck crepe, pleated dress was adorned with tiny beads, which glimmers in the light. Olivia accessorized with TIFFANY & CO jewelry and the necklace was definitely needed. It enhanced the appeal of her sparkly look. Minimal make-up, side parted tresses and GIUSEPPE ZANOTTI heels finished up her look.